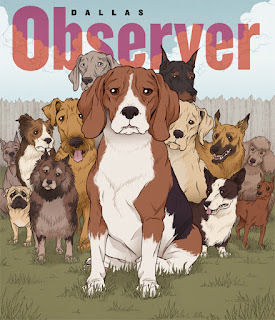 I recently did a cover of the Dallas Observer with Village Voice Media Design Director Tom Carlson. It was a cover story about the stray dog problem in Dallas and the animal rescuers taking them in. Alhough they have good intentions in getting the dogs off of the streets, these people may actually be hoarding the dogs and potentially still putting them in poor conditions. Looks great! Anytime I get to draw animals, I'm a happy man.